Effects of water deficit on plant water status, gas exchange and hydraulic conductance were investigated in Betula pendula under artificially manipulated air humidity in Eastern Estonia. The study was aimed to broaden an understanding of the ability of trees to acclimate with the increasing atmospheric humidity predicted for northern Europe. Rapidly-induced water deficit was imposed by dehydrating cut branches in open-air conditions; long-term water deficit was generated by seasonal drought. The rapid water deficit quantified by leaf (ΨL) and branch water potentials (ΨB) had a significant (P < 0.001) effect on gas exchange parameters, while inclusion of ΨB in models resulted in a considerably better fit than those including ΨL, which supports the idea that stomatal openness is regulated to prevent stem rather than leaf xylem dysfunction. Under moderate water deficit (ΨL≥-1.55 MPa), leaf conductance to water vapour (gL), transpiration rate and leaf hydraulic conductance (KL) were higher (P < 0.05) and leaf temperature lower in trees grown in elevated air humidity (H treatment) than in control trees (C treatment). Under severe water deficit (ΨL<-1.55 MPa), the treatments showed no difference. The humidification manipulation influenced most of the studied characteristics, while the effect was to a great extent realized through changes in soil water availability, i.e. due to higher soil water potential in H treatment. 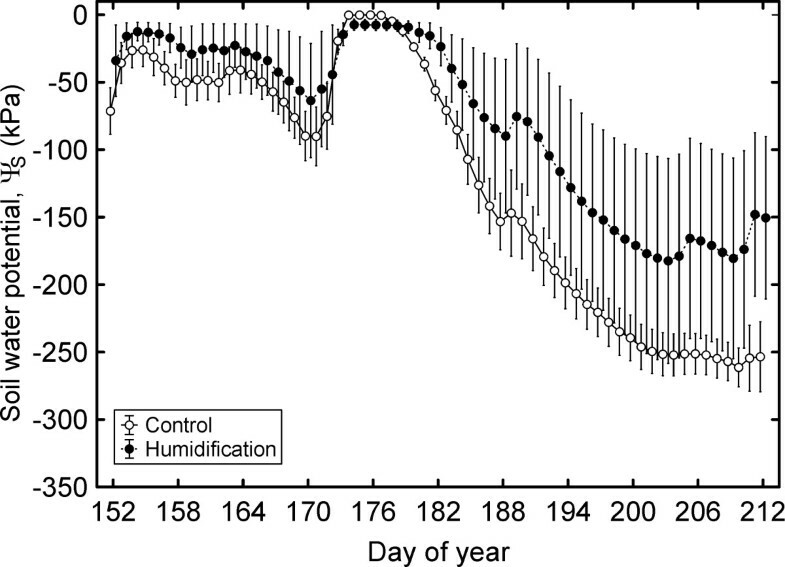 Two functional characteristics (gL, KL) exhibited higher (P < 0.05) sensitivity to water deficit in trees grown under increased air humidity. The experiment supported the hypothesis that physiological traits in trees acclimated to higher air humidity exhibit higher sensitivity to rapid water deficit with respect to two characteristics - leaf conductance to water vapour and leaf hydraulic conductance. Disproportionate changes in sensitivity of stomatal versus leaf hydraulic conductance to water deficit will impose greater risk of desiccation-induced hydraulic dysfunction on the plants, grown under high atmospheric humidity, in case of sudden weather fluctuations, and might represent a potential threat in hemiboreal forest ecosystems. There is no trade-off between plant hydraulic capacity and photosynthetic water-use efficiency on short time scale. Global warming is accompanied by changes in atmospheric water vapour content and precipitation rate, although there will be pronounced regional differences in their magnitude and direction . Over a period from 1900 to 2005 precipitation has significantly increased in northern Europe and continuation of this trend with larger increase in the frequency than in the magnitude of precipitation is predicted from climatic models. Climate change scenarios predict by the end of the century increases in air temperature by 3.5–5ºC and precipitation by 5–30% in boreal and northern temperate regions of Europe [2, 3]. Increase in atmospheric relative humidity (RH), the inevitable result of more frequent rainfall events, will reduce water loss through transpiration [4, 5], and affect both the delivery of nutrients to root absorbing surface and nutrient uptake by trees due to diminished water fluxes through the vegetation [6, 7]. On the other hand, climate extremes including heat waves and droughts across Europe are projected to become more frequent and enduring over the 21st century [1, 8]. Because trees have adapted to local average climatic conditions, extreme events have consequences on forest health and productivity across site conditions [9, 10]. Plants growing in humid air have less effective stomatal control over transpirational water loss [4, 11, 12] and demonstrate higher vulnerability to xylem cavitation, i.e. have narrow hydraulic safety margin [13, 14]. In addition, Okamoto et al. demonstrated that high air humidity induces abscisic acid (ABA) 8′-hydroxylase in stomata and vasculature, followed by the reduction of ABA levels - a plant hormone, which promotes stomatal closure under water deficit . Water deficit decreases stomatal conductance before leaf water potential (ΨL) falls below critical values, to avoid adverse consequences on leaf tissues (dehydration of protoplasm) and water transport system (hydraulic dysfunction through runaway xylem cavitation). However, the mechanisms by which stomata respond to and control ΨL are still unclear [14, 17]. The classical view suggests that a primary signal of water shortage is ABA, produced by roots situated in dry soil and transported to shoots . As a result, a considerable time lag is expected in the response of stomata to changing soil water status. Soil drying concentrates ABA in both the xylem sap and leaves [19–21]. This is followed by water efflux from guard cells and stomatal closure . Stricter stomatal control leads to increasing short-term (intrinsic water-use efficiency ) and long-term water-use efficiency (carbon isotope discrimination ). In Arabidopsis, shoot vascular tissues appear to be a major site of ABA biosynthesis and suggest tissue-autonomous ABA synthesis in addition to its long-distance root-to-shoot movement [16, 25]. Bauer et al. report that guard cells possess the entire ABA biosynthesis pathway and that cell-autonomous synthesis is sufficient for stomatal closure. Thus, effects of fast changes in leaf water status do not involve chemical signals from roots, but rather are predominantly hydraulic [22, 27, 28]. Guard cells respond to changes in ΨL either directly or via a signal generated close by . Stomatal closure, in turn, will increase stomatal limitation to photosynthesis. At severe water deficit, efficiency of photosystem II will decrease as well [12, 30, 31] further impelling decline of CO2 assimilation. The structure and function of the water transport system govern the productivity and survival of land plants because the vascular architecture places a physical limit on plant functioning [29, 32]. Therefore, the water pathway from the soil-root interface to the sites of evaporation in leaves is critical to maintain leaf water status and hold stomata open, keeping a positive carbon budget. Water deficit will induce cavitation of xylem elements in roots, stems and leaf veins [10, 33, 34], thereby reducing water supply to foliage and amplifying water deficit effects on stomatal conductance and photosynthetic performance. Tissue dehydration also impacts aquaporin (AQP) expression controlling hydraulic conductance of the leaf symplastic compartment . Furthermore, as the concentration of ABA increases in the xylem, AQP activity in the bundle sheath cells is down-regulated, thereby reducing water flow into the leaf as demonstrated by Shatil-Cohen et al. .
We analysed the impact of water deficit on plant water status, gas exchange and hydraulic conductance on saplings of silver birch (Betula pendula Roth) under artificially manipulated air humidity in field conditions. Silver birch is distributed widely over almost all of Europe, and in northern Europe it is among the most important commercial tree species. Because trees growing in moist atmosphere experience less water loss and have higher stomatal openness, we hypothesize that physiological characteristics in trees acclimated to higher humidity exhibit higher susceptibility to rapidly-induced water deficit. The primary aim of this study was to test this hypothesis experimentally. Secondly we tested whether the putative trade-off between plant hydraulic capacity and water-use efficiency (WUE) is observable on a short time scale. We aimed this study to broaden the understanding of the ability of trees to acclimate with the increasing atmospheric humidity predicted for northern Europe. 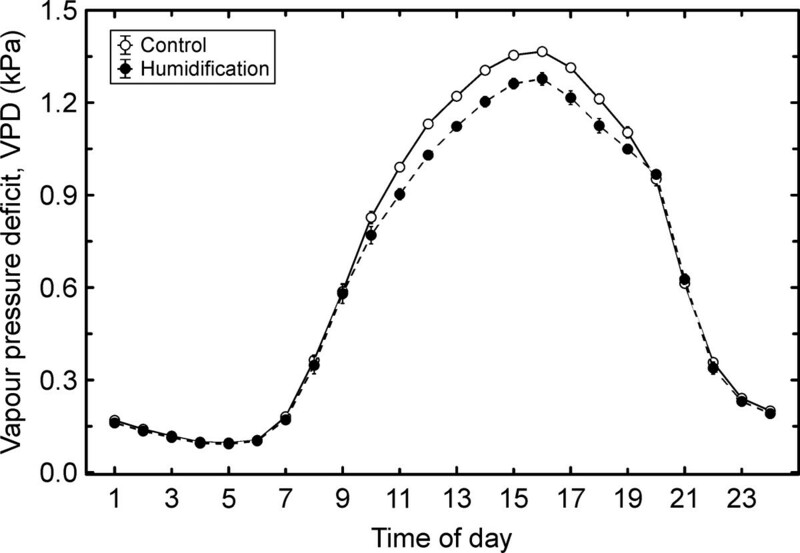 The air humidification caused a decrease of up to 10% in atmospheric water vapour pressure deficit (VPD) during the misting application (Figure 1). ANCOVA revealed that the humidification treatment influenced (P < 0.05) most of the studied characteristics (Table 1). The strongest effects were observed for leaf conductance to water vapour (gL) and leaf water potential (ΨL), whereas leaf temperature (TL), ratio of intercellular to ambient CO2 concentrations (Ci/Ca), net photosynthetic rate (An) and intrinsic water-use efficiency (IWUE) remained unaffected by the manipulation. The rapidly-induced water deficit, quantified by leaf (ΨL) or branch water potential (ΨB), had a highly significant (P < 0.001) effect on all studied parameters. Except for leaf hydraulic conductance, KL, inclusion of ΨB into the analysis model resulted in a considerably better fit than inclusion of ΨL. An analysis of sensitivity of the physiological parameters to changes in plant water status (dx/dΨB), estimated by slopes of the corresponding linear regressions, revealed that almost all variables of trees grown under elevated atmospheric humidity (H treatment) tended to respond more sensitively to water deficit. However, in only two cases the corresponding slopes differed significantly between the treatments (Figure 2): gL (P < 0.05) and KL (P < 0.01). In order to compare the gL and KL responses to each other, we normalised the absolute values with corresponding means and analysed sensitivity of the normalised gL and KL (values of both characteristics below or above 1) to developing water deficit. KL declined 2.3 times (P < 0.01) and gL 1.4 times (P < 0.05) faster in humidity-treated trees compared to the control with decreasing ΨB. Daily variation of mean atmospheric water vapour pressure deficit (VPD) in June and July 2010. The error bars denote S.E. Branch water potential (Ψ B ) versus leaf conductance to water vapour ( g L ; A) and leaf hydraulic conductance ( K L ; B) in control and humidified trees. The numbers by the regression lines indicate the respective slopes. Mean values of the gas exchange and hydraulic characteristics for control (C treatment) and humidified trees are presented in Table 2. 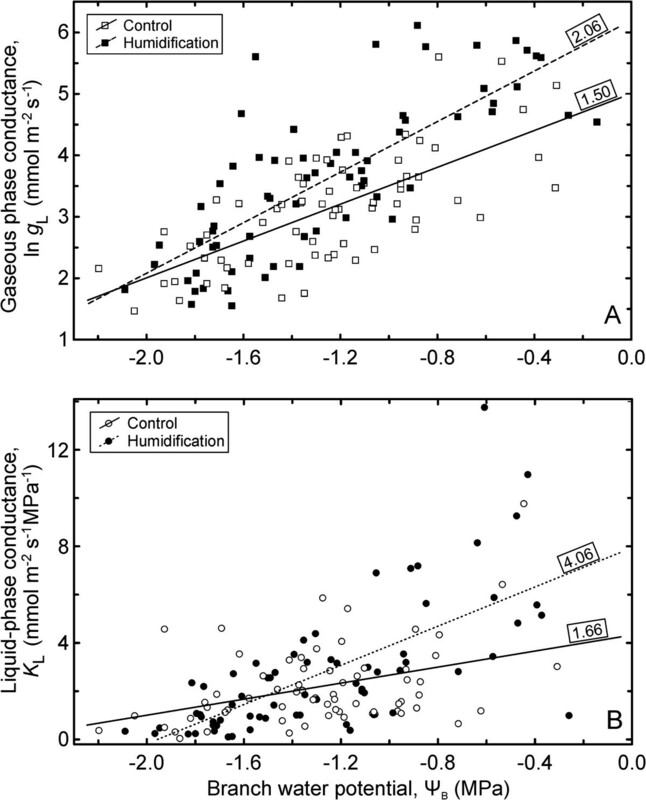 E and gL exhibited greater (P < 0.05) values in H treatment both before branch cutting in the morning and under moderate water deficit (ΨL≥-1.55 MPa). Under moderate water deficit, TL was less and KL greater in H than in C branches (P < 0.05). The means of other gas exchange parameters showed no difference among treatments. Water deficit developed rapidly after branch cutting, thereby leading to a decline in most parameters, including KL. ΨL, leaf water potential; ΨB, branch water potential; TL, leaf temperature; gL, leaf conductance to water vapour; E, transpiration rate; gS, stomatal conductance to water vapour; Ci/Ca, ratio of intercellular to ambient CO2 concentrations; An, net photosynthesis; IWUE, intrinsic water-use efficiency; KL, leaf hydraulic conductance; RL, relative leaf hydraulic resistance; KS-B, soil-to-branch hydraulic conductance; KT, whole-tree hydraulic conductance. Statistical significance of the difference: *P < 0.05, **P < 0.01. Net photosynthetic rates were strongly correlated with stomatal conductance (gS; R2 = 0.970, P < 0.001) across a wide range of stomatal openness for both treatments combined (Figure 3A). At first IWUE increased in response to the rapidly-induced water deficit and attained a maximum of >70 μmol mol-1, corresponding to gS ~0.06 mol m-2 s-1 (Figure 3B). When gS fell below this value (at ΨB < -1.0 MPa), IWUE declined very steeply as An decreased more rapidly than gS. Two characteristics - TL and Ci/Ca - demonstrated opposite trends with increasing water deficit. None of the characteristics differed significantly among the treatments under severe water deficit (ΨL<-1.55 MPa; Table 2). 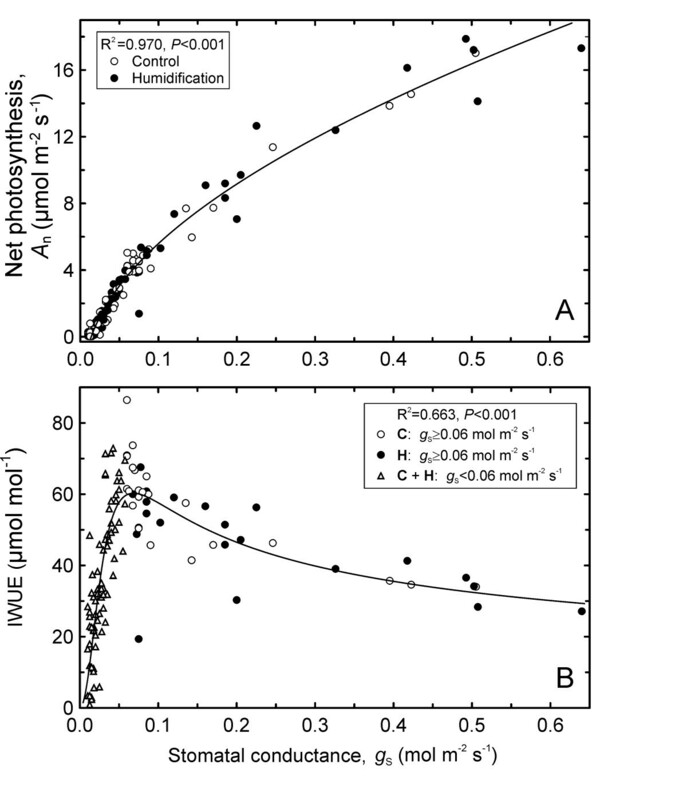 Stomatal conductance ( g S ) versus net photosynthetic rate ( A n ; A) and intrinsic water-use efficiency (IWUE; B) across control (C) and humidified trees (H). Long-term water deficit was imposed by reducing soil water availability due to a moderate drought that developed in July (Table 3; Figure 4). Although the misting application decreased transpirational water loss, bulk soil water potential (ΨS) in H plots also underwent substantial decline (dropped to -180 kPa) in July. Inclusion of ΨS as an index of soil water availability into the analysis models changed the outcome radically: the effect of the humidification treatment became – with one exception – insignificant for all gas exchange and water relations characteristics (Table 4). Only gL depended simultaneously on the treatment (P = 0.036), rapidly-induced water deficit (ΨB; P < 0.001) as well as soil water availability (ΨS; P < 0.001). Consequently, the effects of humidification manipulation were to a great extent realized through changes in soil water status. Four characteristics [gL, E, soil-to-branch hydraulic conductance (KS-B) and whole-tree hydraulic conductance (KT)] were 2.1–2.3 times greater in humidified trees than in control trees. Mean bulk soil water potential (Ψ S ) in control and humidified plots in June and July 2010. The error bars denote S.E. In fact, the differences in physiological characteristics between the treatments recorded on intact branches in the morning (Table 2) reflect co-effects of the air humidification and long-term soil water deficit. The responses of gL and KL to variation in ΨB were analysed also separately for the data obtained before and after cutting branches, and for moister (ΨS>-218 kPa) and drier soil conditions (ΨS≤-218 kPa). Before cutting, neither of the response slopes differed between the treatments; after cutting, both slopes differed significantly between the treatments (gL, P < 0.05; KL, P < 0.01). dgL/dΨB and dKL/dΨB showed no difference within treatments between the different soil moisture ranges. Changes in KL were co-ordinated with those in both stomatal conductance and net photosynthesis, while the relationships were substantially stronger for humidified trees. Specifically, R2 in C treatment was 0.264 and 0.293 for gS and An, respectively. In H treatment the respective R2 values were 0.583 and 0.601 (for all cases P < 0.001). gS and An were associated considerably more strongly with KS-B (R2 = 0.75-0.85) and KT (R2 = 0.80-0.85; Figure 5). IWUE in intact branches declined with increasing hydraulic capacity: with KL (R2 = 0.204, P < 0.05), KS-B (R2 = 0.356, P < 0.01) as well as KT (R2 = 0.356, P < 0.01). There was no statistical relationship between KL and IWUE across the whole data sets (i.e., throughout the whole range of water deficit). The reliability of gasometric measurements was proved by an excellent accord among the readings obtained with different instruments: although gS and total leaf conductance (gL) were measured on different leaves and under different conditions (controlled versus ambient conditions, respectively), the two characteristics exhibited a near perfect concordance (R2 = 0.944 for C trees, R2 = 0.901 for H trees, for both P < 0.001). Co-ordination between gaseous and liquid-phase conductances. 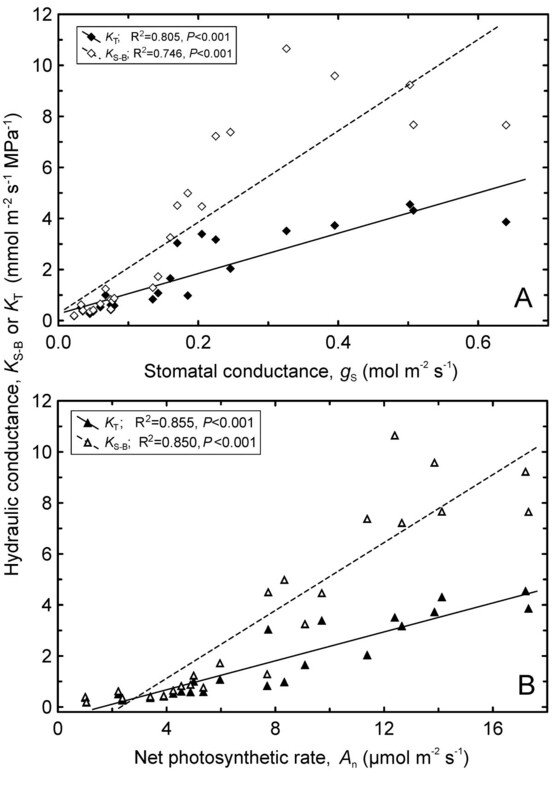 Stomatal conductance to water vapour (gS; A) and net photosynthetic rate (An; B) versus soil-to-branch hydraulic conductance (KS-B) and whole-tree conductance (KT) across humidification and control treatments. The rapidly-induced water deficit had highly significant (P < 0.001) effect on all parameters measured at the leaf level (Table 1). Under moderate water deficit (ΨL≥-1.55 MPa) leaf conductance to water vapour, transpiration rate and leaf hydraulic conductance were significantly (P < 0.05) higher in trees grown at elevated air humidity than in control trees. These differences are attributable to higher initial values (a result of long-term effects) and probably also to larger branch internal water storage in H treatment under moderate drought, although statistically not proven by the ΨB data. Leaf temperature, on the contrary, was higher (P < 0.05) in C trees due to the diminished transpiration. Under severe water deficit (ΨL<-1.55 MPa) the treatments showed no difference in any of the characteristics (Table 2). Two characteristics - gL and KL - exhibited a significantly steeper decline with increasing water deficit in H treatment than in the control, indicating higher susceptibility to weather fluctuations of trees grown under increased RH. The observed stomatal responses are primarily associated with impact of rapidly-induced water deficit and obviously driven by hydraulic signals, because dgL/dΨB did not differ between the treatments in intact branches and did not depend on soil water status if the data was analysed separately in subsets. Thus, the effect of soil drying is secondary. Various mechanisms are suggested as signalling cues to initiate or enhance ABA biosynthesis, including hydraulic signals . The priority of hydraulic versus metabolic stimuli is considered fundamentally important in preventing plant desiccation and is maintained in stomatal control through vascular plant phylogeny [37, 38]. However, the apparent change in stomatal sensitivity to branch water status induced by the humidity manipulation could be due to differences in the leaf-borne ABA levels, as previous reports describe that endogenous ABA concentrations in leaves grown for a long time under high humidity are lower than under moderate humidity [11, 12]. Also fast de novo synthesis or conversion of inactive conjugates of ABA [15, 16] in shoot vascular tissues triggered by branch dehydration cannot be dismissed. Although studies on Arabidopsis thaliana provide crucial information on stomatal responses, species-specific differences exist, especially when the plants are exposed to simultaneously changing environmental factors . Thus, our experiment supports the first hypothesis that trees acclimated to higher humidity exhibit greater sensitivity to rapidly-induced water deficit with respect to two functional traits. However, these changes have different consequences on plant water status. The reduction of gL helps to limit water loss, slows down further ΨL falling and prevents runaway xylem embolism. The impact of decreasing KL is opposite – leaf water supply declines causing ΨL to fall. Birch trees showed differential changes in these two fundamental traits due to the experimental manipulation: the humidity-treated trees exhibited substantially faster water deficit-driven reduction in KL than in gL if compared to the control. Thus, greater risk of leaf dehydration and xylem dysfunction is probably imposed on the trees grown under higher atmospheric humidity in case of sudden weather extremes, because strict stomatal control over water loss is a crucial factor in preventing water deficit-induced xylem cavitation . Plant hydraulic conductance does not limit stomatal openness under moist weather conditions, but it could become crucial in climate extremes (severe drought, disastrous heat wave), which are scarcely predictable and yet will become more frequent in the future . Among ecosystems, forests are particularly sensitive to climate change, because the long life-span and conservative structure of the water-conducting system of trees do not allow rapid acclimation to environmental fluctuations . The air humidification manipulation affected most of the studied characteristics, but not IWUE (Table 1), unlike the soil humidity manipulation reported by Possen et al. . In some species even long-term soil drought does not affect IWUE if An and gS decrease with equal rates . The inclusion of ΨS in the analysis models excluded the treatment effect (Table 4), suggesting that the impact of experimental manipulation in droughty summer (Table 3) is realized largely through changes in soil water status (i.e. due to higher ΨS in H treatment). Only leaf conductance to water vapour (gL) depended simultaneously on the treatment (P = 0.036), rapidly-induced water deficit (P < 0.001) and soil water availability (P < 0.001). However, gL in H trees demonstrated higher sensitivity to water deficit, i.e. an opposite trend to that observed by Fanourakis et al. . Weak stomatal control could be a consequence of the low transpiration in plants grown continuously under high RH (>85%). The degree of stomatal acclimation depends on both the duration and timing of exposure to high RH during leaf development, while determinative is just a stage of leaf expansion completion . In silver birch, elevated atmospheric humidity had the widest consequences on stomatal regulation, as the effects extended beyond that of soil water availability. This is an important point in view of climate change: Roelfsema and Hedrich  argue that stomata will play an essential role in the adaptation of plants to climate change, because of their interrelated roles in CO2 uptake and release of water. As for gS, we observed less pronounced response (compare Tables 1 and 4), obviously because of its being measured under artificial conditions (constant irradiance, temperature and air humidity). The air humidity manipulation led to higher soil water availability (Figure 4) in H treatment due to reduced transpirational water loss [5, 7] under low VPD during the misting application (Figure 1). This resulted in higher hydraulic capacity of the trees grown in more humid environment, i.e. a long-term effect (Table 2). This response was observed under the moderate drought in July 2010 (Table 3). By contrast, we did not observe unequivocal shifts in hydraulic traits in the rainy summer of 2009: KL decreased, while hydraulic conductance of root systems (KR) and leaf-specific conductivity of stem-wood increased in response to elevated RH . The present study revealed some alleviating effect of elevated RH under moderate drought, and the plant response to increased air humidity seems to differ depending on prevailing weather conditions. Nor can we dismiss increased xylem vulnerability and possible hydraulic dysfunction under unexpected severe drought, although on average the climate will become more humid at high latitudes [2, 3]. The differences in KS-B and KT observed on intact trees in 2010 likely ensued from xylem cavitation in response to differential soil drying (i.e. a long-term effect) in the treatments. The differences in KL resulted from rapidly-imposed water deficit rather than soil water availability, because KL measured on intact branches showed no significant difference between the treatments (Table 2) and dKL/dΨB was invariant of soil water status. KS-B demonstrated a greater intertreatment variation compared to KL - by a factor of 2.3 versus 1.6, respectively. This is attributable to greater susceptibility of root xylem than of shoot xylem to water stress-induced embolism [33, 43]. Domec et al. reported that KR declines faster than KL as soil dries. The increasing resistance between soil and trunk has been shown to be the main cause of KT decline and has also the highest weight in the stomatal control . We cannot exclude also concurrent mechanisms responsible for the differences in the decline of KS-B versus KL, such as that associated with contribution of apoplastic versus cell-to-cell route to liquid water transport under water deficit. When transpiration stream is attenuated, plasma membrane AQPs are upregulated, the membrane water permeability increases and transcellular water flux becomes much more significant . One must consider that the soil-to-branch pathway represents predominantly an apoplastic route, while in leaves the contributions of the two routes to the total hydraulic resistance are of the same magnitude . Nevertheless, Johnson et al. [48, 49] measured KL concurrently with ultrasonic acoustic emissions in dehydrating leaves of several woody species and presented reliable evidence that xylem embolism is a primary factor in dehydration-induced declines in leaf hydraulic conductance. Findings of Nardini et al. highlight the role of regulation of KL in plant acclimation suggesting that leaf resistance to drought-induced hydraulic dysfunction is a key to plant survival and competition even over limited geographical ranges. Net photosynthetic rate (An) and stomatal conductance (gS) in silver birch were positively correlated with plant hydraulic characteristics (Figure 5), whereas gas exchange parameters were considerably more strongly associated with KS-B or KT than with KL. This result confirms that maximum gS and An depend on hydraulic conductance of the whole soil-to-leaf pathway (expresses potential capability for leaf water supply) rather than solely on that of the leaf [45, 51, 52]. The rapidly-imposed water deficit affected (P < 0.001) all parameters measured at the leaf level, showing substantially stronger association with ΨB than with ΨL (Table 1). Thus, the gas exchange and stomatal conductance of silver birch are determined by direct water availability to the leaf, estimated by ΨB in the petiole insertion point, rather than by the current leaf water status (ΨL) itself. The relationship between gas exchange and ΨB is probably mediated by stem hydraulic capacitance, because the internal water storage in trees plays a role in mitigating diurnal fluctuations in plant water status caused by transpirational water losses [14, 53]. So, plants with a great capacity to avoid high stem water deficits during periods of high transpiration tend to have a relatively risky stomatal strategy and maintain higher midday gS. On the other hand, our results support the idea that stomatal openness is regulated in a way to prevent primarily dysfunction of stem xylem, as proposed by Meinzer et al. . This is likely a general trait for broad-leaved trees, as recently reported for a number of subtropical tree species . Leaf gaseous phase conductance began to decrease simultaneously with KL in response to the rapidly-imposed water deficit, i.e. with no threshold level in the water potential range experienced in the present study. This result coincides with that obtained on leaves of Quercus, Pinus and Pseudotsuga species . Although the field measurements under uncontrolled conditions did not allow construction of vulnerability curves, our data imply narrow hydraulic safety margin existing in silver birch (the 50% decline of KL was observed at about -1.2 MPa), a characteristic of angiosperm species . Blackman et al. sampled 20 phylogenetically disparate woody angiosperms and found that the greater the water potential inducing a 50% loss in KL, the narrower the safety margin. This trait suits well with general life strategy of a fast-growing pioneer species, such as B. pendula. In this context the present result is consistent with our previous findings: stomatal sensitivity of sun leaves of B. pendula to atmospheric VPD (80 mmol m-2 s-1 ln(kPa)-1) exceeds the corresponding mean of angiosperms (73 mmol m-2 s-1 ln(kPa)-1). Contrary to the paradigm that isohydric species avoid cavitation, it has been revealed that relatively isohydric species tend to experience far greater cavitation and refilling of xylem on a daily basis than anisohydric species, the benefit of which is enhanced capacitance for use in transpiration . Silver birch has been reported to be able for efficient acclimation to lack of water, including adjustment of WUE . Thus, the drought developed in Estonia in summer 2010 was not severe enough to induce significant changes in photosynthetic water-use efficiency (IWUE; Table 4). Our earlier studies [57, 59] performed on large birch trees growing in a natural forest stand revealed the opposing height-related trends in IWUE and soil-to-leaf hydraulic conductance (KT) within tree crowns at sufficient light intensities, suggesting a trade-off between water transport and use efficiencies. The inverse relationships between hydraulic characteristics and IWUE found in this study suggest that the respective trade-off between hydraulic capacity and WUE occurs in silver birch both at the leaf (KL) and whole-plant levels (KT). The trade-off reflects co-ordinated adjustment of plant gas exchange and hydraulic system to long-term water deficit, but not a response to rapidly-imposed interference; therefore, the converse relation was discovered only in intact branches. Hence, it is always necessary to consider time scales when analysing trends in plant WUE. Abril and Hanano  indicated that WUE in Mediterranean woody species reduces during the day by water stress, but it increases as seasonal drought proceeds. Our results support the hypothesis that physiological traits in trees acclimated to higher air humidity exhibit higher sensitivity to rapid water deficit with respect to two characteristics - leaf conductance to water vapour and leaf hydraulic conductance. Disproportionate changes in sensitivity of stomatal versus leaf hydraulic conductance to water deficit might impose greater risk of desiccation-induced hydraulic dysfunction on the plants, grown under high RH, in case of sudden weather fluctuations. We failed to discover a short-term trade-off between plant hydraulic capacity and photosynthetic water-use efficiency. The impact of air humidity manipulation was realized principally through changes in soil water availability, while the treatment may have different effects on plant functioning depending on weather conditions prevailing during the growing season. The studies were carried out on 5-year-old silver birch (B. pendula) trees in an experimental forest plantation at the Free Air Humidity Manipulation (FAHM) site, situated in Rõka village (58°14′N, 27°17′E, 40–48 m ASL), Eastern Estonia, representing a hemiboreal vegetation zone. The long-term average annual precipitation in the region is 650 mm and the average temperature is 17.0°C in July and -6.7°C in January. The growing season lasts 175–180 days from mid-April to October. The soil is a fertile Endogenic Mollic Planosol (WRB) with an A-horizon thickness of 27 cm. Total nitrogen content is 0.11-0.14%, C/N ratio is 11.4, and pH is 5.7–6.3. Three sample plots served as control areas (C treatment) and three plots were humidified (H treatment) using the computer-operated FAHM system. The system integrates two different technologies - a misting technique to atomize/vaporise water and a FACE-like technology to mix humidified air inside the plots, enabling relative humidity of the air (RH) to be increased by up to 18% over the ambient level during humidification treatment, depending on the wind speed inside the experimental stand. The humidification was applied in daytime 6 days a week throughout the growing period if ambient RH was <75% and mean wind speed <4 m s-1. As a long-term average, RH was increased by 7–8%. A detailed description of the FAHM site and technical setup has been presented by Kupper et al. . The manipulation was started in June of 2008; gas exchange and hydraulic measurements were performed on 15 H and 15 C trees in June and July of 2010. Environmental variables measured continuously were air temperature (TA) and relative humidity (RH) with HMP45A humidity and temperature probes (Vaisala, Helsinki, Finland), precipitation with TR-4 tipping bucket rain gauges (Texas Electronics, Dallas, TX), bulk soil water potential (ΨS) with EQ2 equitensiometers (Delta-T Devices, Burwell, UK) at depths of 15 and 30 cm. The readings of the sensors were stored as 10 minute average values with a DL2e data logger (Delta-T Devices). One sample branch (mean height above the ground 140±9.3 cm for C trees and 138±8.4 cm for H trees) per tree from the middle third of the crown was selected for gasometric and hydraulic measurements. Two branches, one from C and another form H treatment, were sampled simultaneously using two instruments. Net photosynthetic rate (An), stomatal conductance to water vapour (gS) and ratio of intercellular to ambient CO2 concentrations (Ci/Ca) were measured with a LCpro+ portable photosynthesis system (ADC BioScientific, Hoddesdon, UK) on four or five leaves per branch at a saturating photosynthetic photon flux density (1196 μmol m-2 s-1) applying constant CO2 concentration (Ca = 360 μmol mol-1), air humidity (water vapour pressure 15 mbar) and temperature (25ºC). Leaf conductance to water vapour (i.e. total gaseous phase conductance, gL), transpiration rate (E) and leaf temperature (TL) were measured on six leaves per branch with a LI-1600M steady-state diffusion porometer (Li-Cor, Lincoln, NE) at ambient conditions. Intrinsic water-use efficiency (IWUE) was calculated as the ratio of An to gS[41, 60]. Bulk leaf water potential (ΨL) was determined in four detached leaves by the balancing pressure technique using a Scholander-type pressure chamber simultaneously with gas exchange measurements. Xylem water potential of the branches (ΨB) was estimated by applying the bagged leaves technique, sampling two leaves per branch at each measurement time, prepared the previous evening. Water potential of the non-transpiring (bagged) leaves, presumed to have equilibrated with the xylem water potential of the branch proximal to the petiole, was taken as an estimate of ΨB. The first measurement series was performed on intact branches in the morning immediately before branch cutting. Then the sample branches were cut off and allowed to dehydrate in open-air conditions in order to generate a rapidly-imposed water deficit. The next four measurement series were conducted within ~3 h after cutting. All measurements were done on dry leaves under non-misting conditions: on intact branches in the morning before misting started and after that outside the experimental plots. where E is the evaporative flux. As E is expressed per unit leaf area, values of KL have been scaled by leaf area. KL was standardized for the dynamic viscosity of water at 28ºC. Soil-to-branch (KS-B) and whole-tree hydraulic conductance (KT) were calculated analogically based on water potential drops across the corresponding segments (ΨS-ΨB and ΨS-ΨL, respectively). KS-B and KT were left unstandardized, because of variable temperature along these long transport pathways. where SSeffect is the sum of squares for given effect and SSerror is the sum of squares for the respective error term. This study was supported by the Estonian Science Foundation (Grant no. 8333), by the Estonian Ministry of Education and Research (target financing project SF0180025s12), and by the EU through the European Regional Development Fund (Centre of Excellence in Environmental Adaptation). We are grateful to Jaak Sõber for operating the FAHM humidification system and Robert Szava-Kovats for language revision. AS designed and performed the experiment, and wrote the manuscript. AN, EÕP and PK performed the experiment, analyzed the data and revised the paper. All authors read and approved the final manuscript.